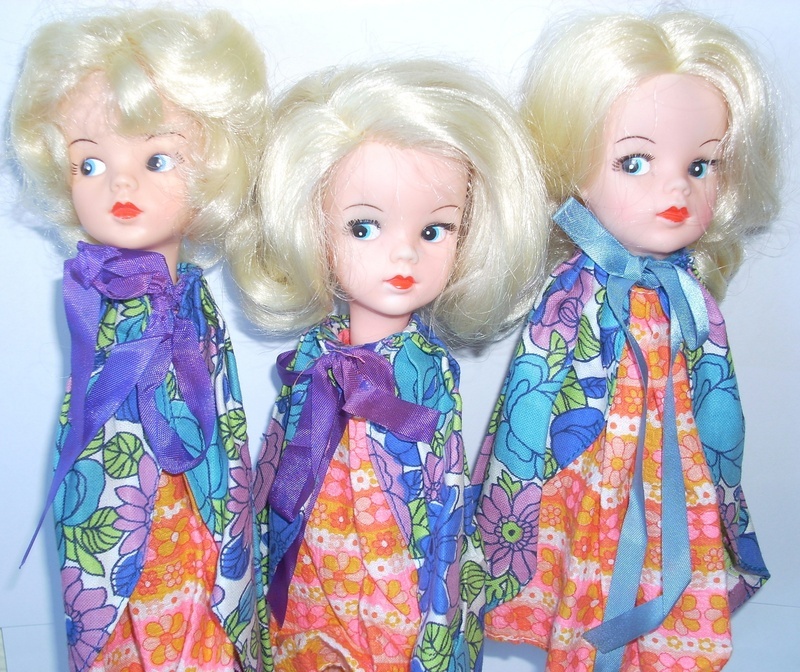 Here are three fabulous Sindy puppets. We can confirm that they are all absolutely authentic and original. The puppets are all slightly different sizes. 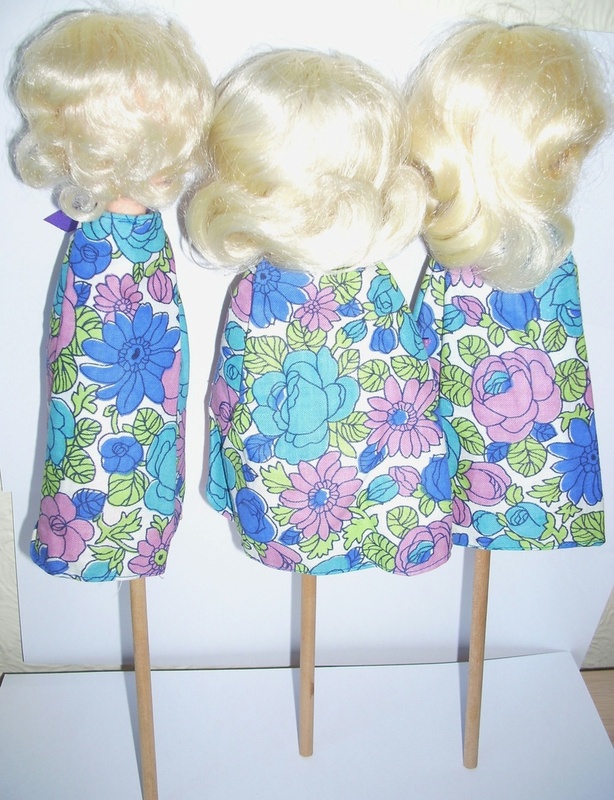 The Marilyn Sindy has an 10¼ inch stick, the Sidepart head has an 8½ inch wooden stick, and the Centrepart head has a 10 inch stick. Their dresses and cloaks are made of the same material and are glued to the neck of each doll. The cloaks are cotton, the starched 1970's type, and the dress underneath is seersucker cotton. The ribbon is a satin/silky type. The clothes are stuck round the pole with a strong glue which has dried out a bit and become brittle. There are no labels on the clothes. The Sidepart and Centrepart heads have very long eye lashes as well as 4 painted eyelashes at the corner of the eyes. 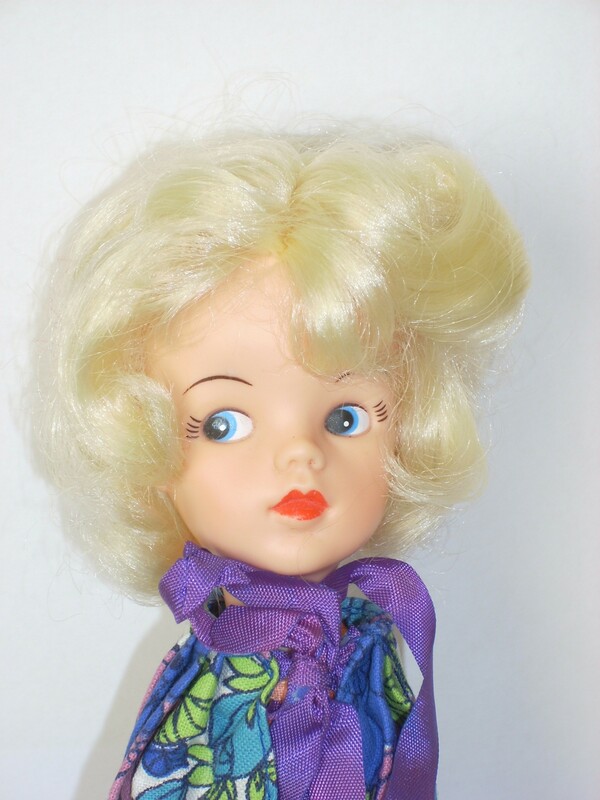 The Marilyn Sindy, of course, does not have 'real' eyelashes but she has the four painted lashes. All their lips are bright red and the eyes glance sideways. They have lovely soft hair. 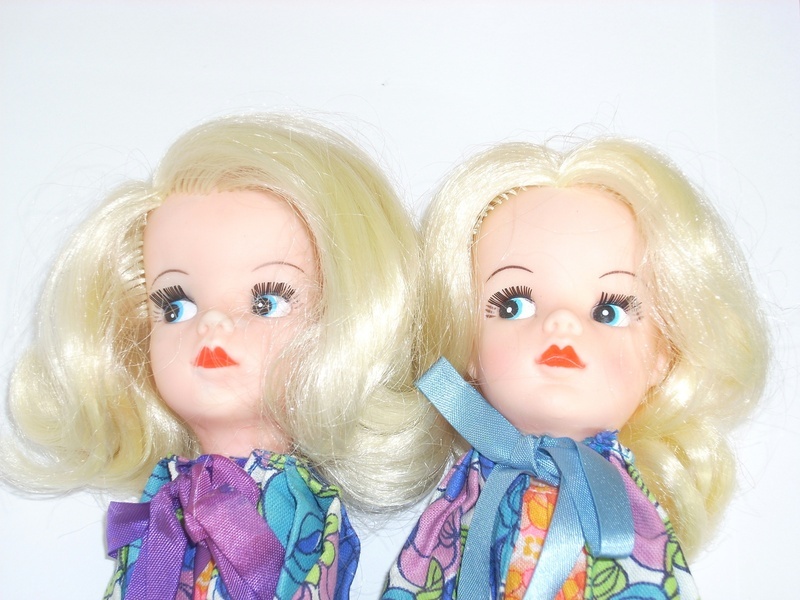 The Sidepart doll is platinum blonde whereas the Centrepart doll is golden blonde. 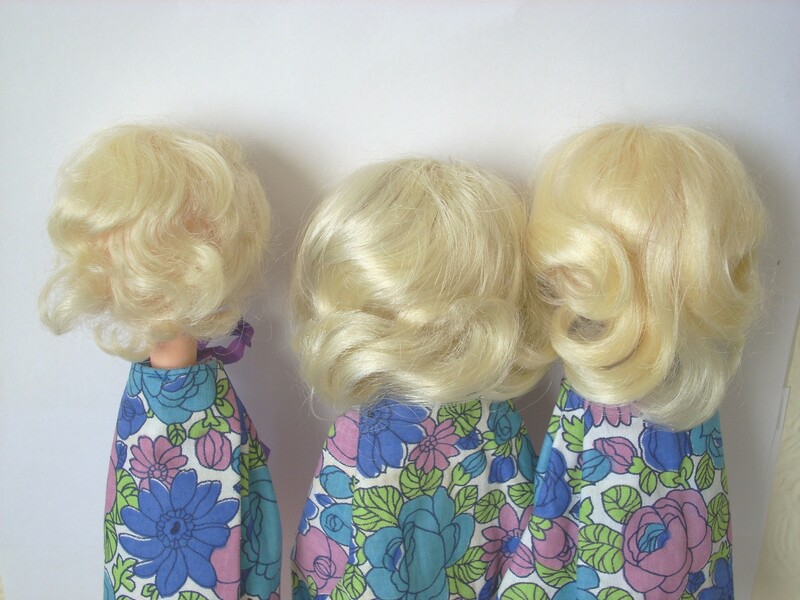 The Marylin has a shade of hair which the owner describes as being a shade in-between the other two dolls' hair - white blonde she thinks. It is also of a different texture. All the puppets are marked Made in Hong Kong in Capitals on the neck. Perhaps the Hereford puppets were a donation from such a toyshop or from the manufacturer (if they were still in box in a toyshop some twenty years later maybe they didn't sell very well), or perhaps like other dolls' hospitals they operated as a toyshop too and these dolls were just their normal stock. Mansell suggested that perhaps Pedigree were using up old stock, and that could be the case. Alternatively, following the collapse of the Lines Bros. empire in 1971, the liquidators broke up and sold off component parts of the Lines Brothers Group and perhaps this included some of the stock also. We think these puppets were made by Good-Wood Playthings which did have a connection with Pedigree, because this little company was set up by Walter Lines when he retired from Lines Bros in 1962. 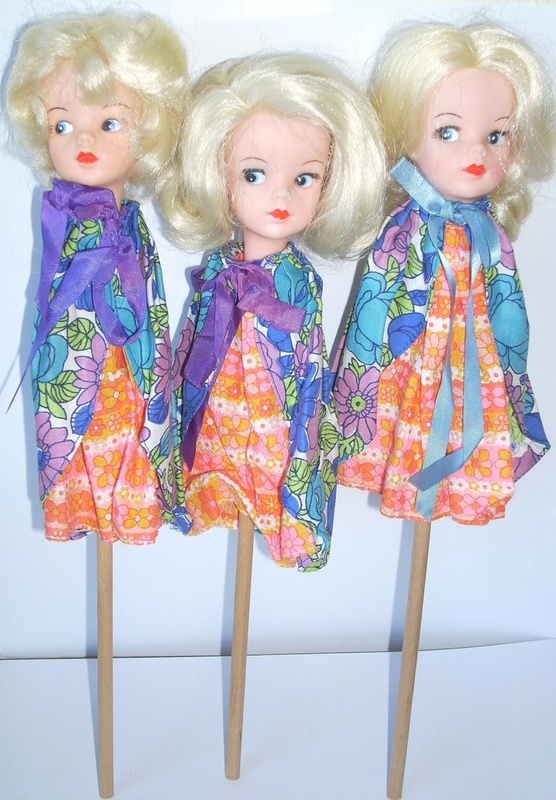 Perhaps they saw a use for these surplus Sindy heads and made these puppets for sale. The theory that these puppets were actually made by Good-Wood would tie in exactly with the Good-Wood Sindy Jack in the Box which is wearing exactly the same outfit, and which is also on display in this Museum.